Yikes! I have been typing up recipes all morning, (I type about 15 words a minute), when I should be baking or doing homework. I promised Dave a big homestyle dinner tonight. I still have many posts to input, but I think this is all I'll get to today. If you have the ingredients for these at home, I suggest you bake these for the weekend. They are fabulous. Easy to make, but so flavorful. You can easily make these vegan but using egg substitute for the eggs. This genius recipes comes from www.joyofbaking.com. Preheat oven to 350 degrees F and place rack in center of oven. Place fluted paper liners in 18 muffin cups. Toast the nuts for about 8 minutes or until lightly browned and fragrant. Let cool and chop coarsely. In a large bowl whisk together the flour, sugar, baking soda, baking powder, salt, and ground cinnamon. Stir in nuts and coconut. Set aside. In a separate bowl, whisk together the eggs, oil, and vanilla. 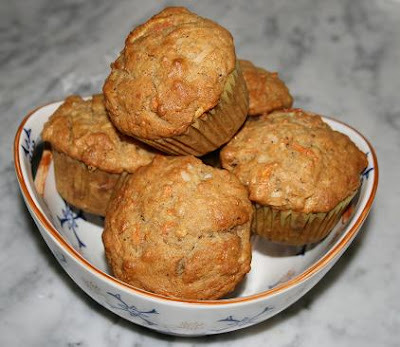 Fold the wet ingredients, along with the apple and carrot, into the flour mixture, stirring just until moistened. Evenly divide the batter between the prepared cupcake cups and bake for 20-25 minutes, or until a toothpick inserted comes out clean. These really don't need any frosting, but you could dust them with a bit of powdered sugar.